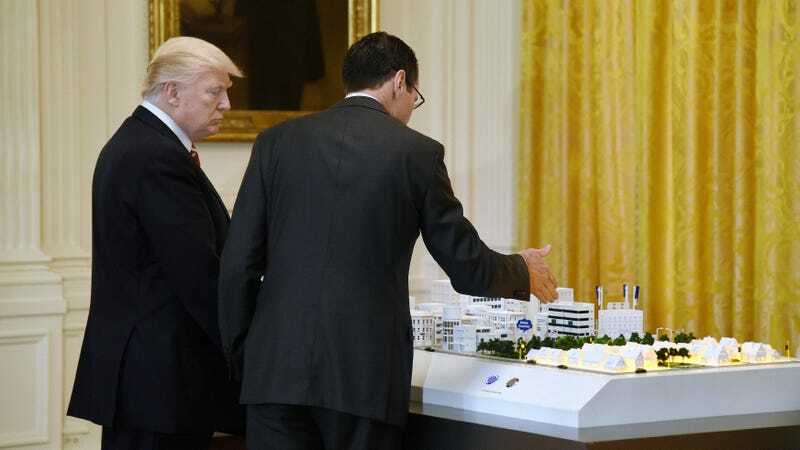 AT&T Senior Executive Randall Stephenson (R) explains to President Donald Trump how the 5G will be deployed in cities during the American Leadership in Emerging Technology Event at the White House, on June 22, 2017. The Trump administration’s ambitious plan to speed up 5G deployment across the country—namely by curbing the decision-making power of local governments in its construction—is headed for its first legal hurdle. Several U.S. cities are poised to seek relief from the courts, arguing, in part, that the regulations passed by the FCC last week are burdensome, unfairly limiting the cities’ ability to recoup fees from telecom providers. The Federal Communications Commission (FCC) voted in September to place the rollout of 5G, the next generation of wireless technology, in the hands of the federal government, stripping away the power of local officials to negotiate directly with telecoms such as AT&T over the cost and placement of 5G equipment. The effect of the change is this: Cities will take in considerably less revenue from fees charged to telecom providers for mounting wireless equipment on city property. What’s more, the amount of time local officials have to dispute where the equipment is placed has been reduced to a 60- to 90-day window. 5G connection speeds are reputed to be up to 100 times faster than the current generation of cellular service. But to accomplish this, 5G relies on high-frequency waves that cannot travel the same distance allowed by current cellular technology. To achieve 5G speeds, cities and towns will inevitably do away with the massive cell towers recognizable to most Americans and replace them thousands of smaller towers mounted primarily on utility poles throughout the city. Higher estimates place the number of new cell sites needed at roughly 100 times what’s currently in place. Talks of similar suits have sprung up across Massachusetts, the Boston Globe reported Tuesday. The counter-argument offered by proponents of the FCC rules is that local governments will impede the 5G deployment amid a global race for higher internet speeds by politicizing the process or charging telecom providers exorbitant fees. The move was praised, for example, by the Wall Street Journal editorial board, which argued that cities are likely to pit telecom companies against one another in an effort to jack up utility pole rental fees beyond what the newspaper determined are fair market rates. In San Jose, California, the WSJ noted, rental fees accrued from utility placement is used by the city to help boost internet access in low-income neighborhoods. Los Angeles, too, has sought to balance the number of 5G permits handed out between wealthy and poorer areas—a move the newspaper painted as unnecessary and political because, it argued, “there will be sparse demand for 5G in low-income neighborhoods” over the next few years.